Principal researcher, UX strategist, information architecture and accessibility consultant. Translator. 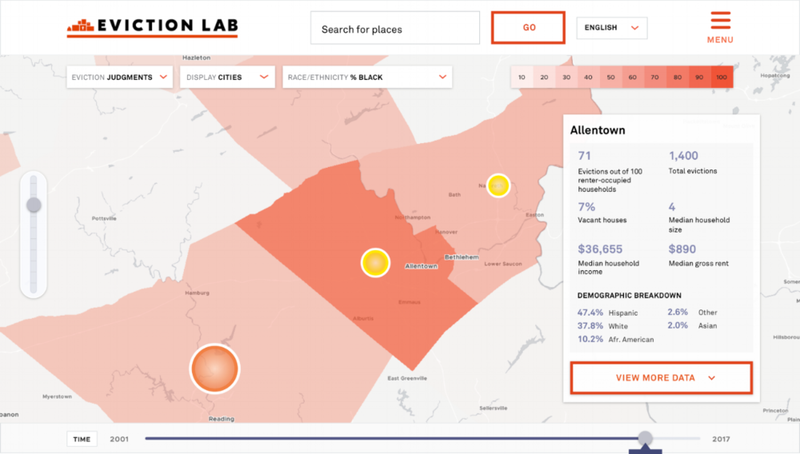 Objective: The Eviction Lab at Princeton wanted to create a data visualization and mapping tool for eviction and census data across the UX. The major challenges were to make the website beautiful, intuitive, usable, and accessible. This project had the potential to make a huge impact. We wanted to be thoughtful about the design and development. I developed this strategic approach to our testing and design/development process. We did 5 rounds of usability testing across desktop and mobile, with both remote (desktop) and in-person (mobile) usability sessions. We were on a very tight budget, so participants volunteered their time. They were recruited on social media such as LinkedIn, Slack, Facebook, and Twitter. A concerted effort was made to recruit a wide variety of ages, genders, disability/ability, and ethnicity/racial backgrounds. From August, 2017 to November, 2017, I conducted 5 total rounds of usability testing with 5-10 participants per round. Each session lasted approximately an hour, and either took place remotely with the participant in the location of their choosing or in-person in a public area of their choosing (usually a coffee shop). For the first 4 rounds, I showed participants two different designs, alternating which design each participant saw first to control for learning effects. The last round was one design that was coded by the development team to look and act like the finished product. Overall, usability testing showed that participants highly valued the ability to control their experience. Mobile was a unique problem in that we had very little screen space and a very packed UI. As a team, we needed to think creatively about how to make it both intuitive and full-featured. This version failed miserably. Participants were so confused by the icons. They didn't know why they had to select all three of the filters once they found them. They did not make any association between the variables and the colors and shapes. The result? They immediately scrolled to the data panel below the fold to try to find something that made sense. I redesigned the interaction so that the dropdowns appeared and disappeared on tap, allowing the user to select one filter at a time. This version tested extremely well. Participants were able to make the connection between the shapes and colors and the variables they had selected, and therefore spent a lot more time exploring the map before going to the data panel. The icons were also redesigned after this iteration to be more clear what they represented. This project was extremely rewarding. We successfully built a product that is socially impactful and is beautiful and easy to use. It has been used by the New York Times, NBC affiliates, and other media outlets as well as by researchers and students. This is just a piece of the UX work involved in making the Eviction Lab site a success. Feel free to reach out to discuss further!